My youngest son has a serious mental illness. (We love him dearly.) 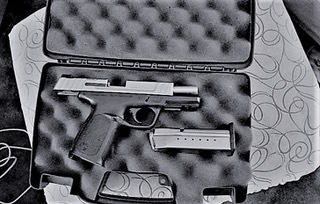 Recently, he purchased a handgun, without my knowledge, and brought it loaded into my home. He was afraid and wanted to "protect" himself. (Our home had been robbed and our car had been stolen years prior.) I had the police called and they took the gun at my request. Now, I'm working with a detective to see if this gun was stolen, and to let the owner know he sold a gun to a mentally ill person. Rather than harming someone else with the gun he purchased, it's more likely my son could have killed himself. He's more afraid of what's in his mind than of what's in front of him. According to the American Psychiatric Association, https://psychiatryonline.org/doi/pdf/10.5555/appi.books.9781615371099 (2016), "Mass shootings by people with serious mental illness represent less than 1% of all yearly gun-related homicides. In contrast, deaths by suicide using firearms account for the majority of yearly gun-related deaths." According to the detective, there's no information on file with the Salt Lake City Police Department that my son has a mental illness and has been in mental health court. There's no information about his multiple hospitalizations. This is key information for any police officer ever confronting my son. They should have notes on file about how best to de-escalate him. De-escalating a paranoid person who is in psychosis takes knowledge, wisdom, and practice. 1. Serious mental illness with psychosis, depression, history of suicide attempts. 2. Call parents (names and numbers) immediately. 3. Does not belong in jail. Needs hospitalization. Paramedics are friends to him. Call them. 4. Previous domestic violence protective orders . 5. Responds to questions, subject highly intelligent. "Do you go by Mitch or Mitchell?" "Which do you prefer?" "Tell me about what brought you here today?" "Can I get you a cigarette (be ready to give him one)?" "Can I get you something to eat or drink (be ready to offer something)?" "Tell me how Dr. Gray has been able to help you in the past?" These questions are unique to my son and could be used to de-escalate his actions. But how would a police officer know? We have to have the ability to collaborate with our police force. I continue to research. I am finding that laws are different from state to state. (New York Times) There's no uniform way practiced to approach our mentally ill other than to shame them or to use a gun on them. I have to say that the Salt Lake City Police Department, in encounters due to my son's behavior, has been professional and above par over the years. We have a Utah Crisis Intervention Team (CIT). The Taylorsville and West Valley City PD are a different story. I can't say the same about my experience with those forces. When you see such disparity in quality of care, you want to advocate for better training and selection, and for more transparency. Our society has a hell of a way to go when working with the chronically homeless and those with persistent mental illness. I ask that you please vote for people who advocate for sensible gun reform and for funding for services such as affordable housing for the mentally ill. Having a place to call home is so important to many. Thank you for helping to save lives with your vote and penchant for educating yourself with facts.